Every New Year’s Day, many people start the year off by having black eyed peas. Why? Because the superstition is that they are lucky. Well here’s a dish that will give you luck, help you keep your new year diet, and is very high in nutritional value. 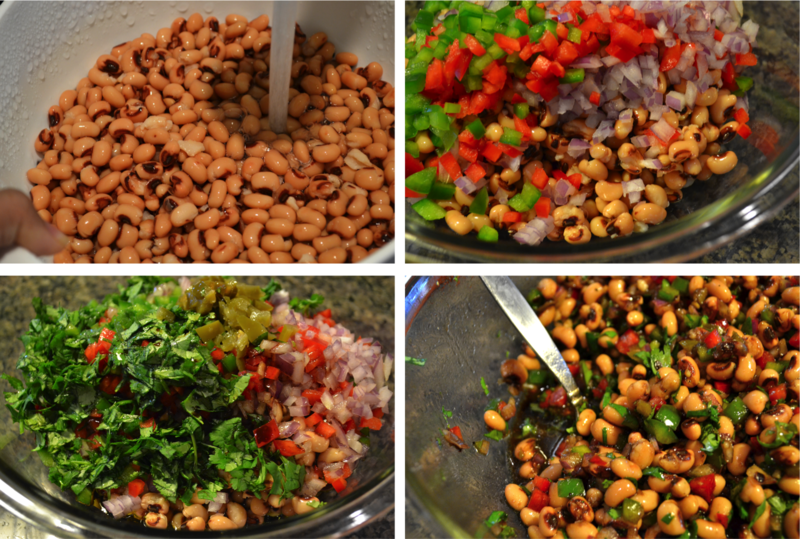 This black eyed pea salad is another dish I learned to make while participating in the Daniel Fast. The veggies give a nice crunch, the vinegar gives it zing, and the jalapenos give it a kick. A fantastic combination! Note: Many canned jalapenos have sugar in them. If you are making this for the Daniel Fast be sure to check the label! I like to pair this salad with my homemade baked tortilla chips. I buy organic whole wheat tortillas from Trader Joe’s. These are honestly the best tortillas for making chips with. They crunch up very nicely and have great flavor. A little olive oil, salt, pepper – and you have homemade chips that go well with anything! In a large bowl, stir together peas, onions, bell peppers, jalapenos, and cilantro. Add oil, vinegar, jalapeno juice, salt and pepper to taste. Stir well to combine. Serve at room temperature or chilled. Preheat oven to 375F. Pour a couple of swirls of oil onto tortillas. Both sides of tortilla should be lightly coated with oil. Sprinkle both sides of each tortilla with salt and pepper. Using a pizza cutter, cut tortillas into triangles. Spread out tortilla pieces over a baking sheet. Cook for 7 minutes, flip, and then continue cooking for another 5-7 minutes or until done. Chips will be lightly browned and crispy.